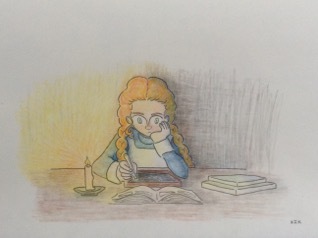 This week's Anne of Green Gables Read-a-long, "Chapter XVI: A New Interest in Life," offers up an interesting artistic response by cartoonist, Elfrieda Dapplelynn. All of the comics are illustrated by her. Welcome, Elfrieda! As the rain pours from the grey clouds, this chapter begins like a dismal rainstorm in November, leaving the world sorrowful. Until slowly, the storm starts to cease, as tiny rays of hope penetrate the covering and in the end there are more rays shining through, dappling the earth, shaking off the tears of rain, and awaking for a new journey through life. Anne Shirley experiences this rainstorm when she has to say goodbye to her bosom friend, Diana Barry. In their farewell, the reader notices that Anne starts romanticizing her dialogue by using “thou” and “thee”, and finds it amusing; Anne is turning this parting into a theatrical spectacle! Of course she does this on purpose, when the reader reads her thought, “… not a little consoled for the time being by this romantic parting.” Since she still cannot believe that Diana cannot be her friend anymore, Anne makes the farewell into a scene, just as if she and Diana were playing, facilitating it for Anne to accept her blighted fate. During the farewell, Anne makes Diana promise to still be loyal to her secretly. This seems to bond the two to their friendship even tighter than their Solemn Vow, since now they do not know when they will be able to be with each other again. 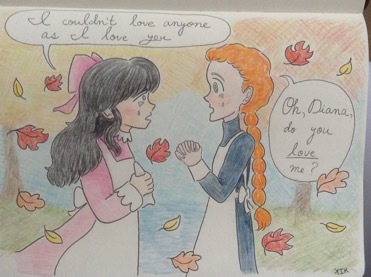 When Diana vows to their secret friendship, she states that she loves Anne, which surprises Anne because she never thought anyone could love her. The reader can be bewildered by this, because they know that Marilla and Matthew also love Anne, therefore the reader is confused why Anne does not see their love. However, neither Marilla nor Matthew, have expressed their love explicitly as Diana has, therefore how should Anne, a girl who no one has ever told that they loved her, know that her two guardians love her as well? Montgomery, in this farewell entwines the importance of friendship and love; one must be loyal to their friends in times of trouble and remember to state their love for them. Even Anne says, Diana’s statement that she loves her, is a ray of hope for her, and it is the first one that penetrates this storm. It gives Anne something to hold on to in this tragic moment. Even though her friend is not with her, she knows in her heart that Diana still loves her and maybe one day they will be together again. The next Monday, Anne leaves for school, hoping that she can still see Diana there, and hopefully interact with her. Alas, Diana will not even look in her direction, since she is obedient to her mother. However instead of moping, Anne begins her “new interest in life”: education. It is inspiring how Anne battles despair by focusing on her studies instead of letting it swallow her up. As Anne returns to school, more hope starts to shine in her way since the students who missed her give her special gifts, showing how much they appreciate her, and offer their friendship. Usually friends change, especially in school, as new ones come and old ones go. However even though Anne accepts most of the gifts, she does not take the opportunity for a new bosom friendship; showing her loyalty to Diana. When Anne plunges into her studies, she believes that she does not acknowledge the existence of Gilbert Blythe. However, the reader knows that he is one of the factors why she is studying so vigorously: she does not want to be defeated by him. 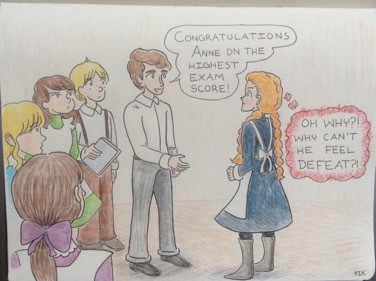 Competition is not always a bad factor in life, since it pushes some to their potential, which is happening to Anne when she is competing with Gilbert. Their competition is helping them both with their studies; making them more self-disciplined, nourishing their interest in higher education and also gradually forming a bond of companionship between them. With her studies, Anne has little time to muse over Diana and “the days departed,” but whenever she does, it brings her sadness even if it keeps the loyal flame of friendship glowing in her heart. Anne knows that she cannot think about the past since she has to cultivate her new interest of education. Therefore, she continues to journey through life, knowing that there is hope out there for the better because “... one can’t stay sad very long in such an interesting world, can one?”.